The Notting Hill Mystery was first published between 1862 and 1863 as an eight-part serial in the magazine Once a Week, written under the pseudonym Charles Felix. It has been widely described as the first detective novel, pre-dating as it does other novels such as Wilkie Collins’s The Moonstone (1868) and Emile Gaboriau’s first Monsieur Lecoq novel (1869) that have previously claimed that accolade. The story is told by insurance investigator Ralph Henderson, who is building a case against the sinister Baron ‘R___’, suspected of murdering his wife in order to obtain significant life insurance payments. Henderson descends into a maze of intrigue including a diabolical mesmerist, kidnapping by gypsies, slow-poisoners, a rich uncle’s will and three murders. 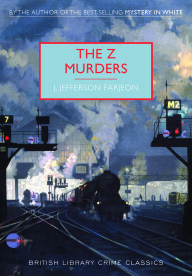 Presented in the form of diary entries, family letters, chemical analysis reports, interviews with witnesses and a crime scene map, the novel displays innovative techniques that would not become common features of detective fiction until the 1920s. 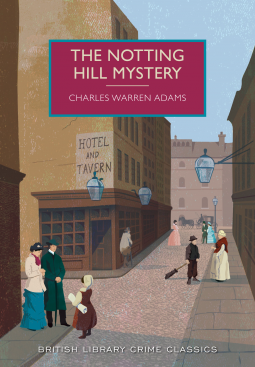 Now made available again, with George du Maurier’s original illustrations included for the first time since the original serial publication, this new edition of The Notting Hill Mystery will be welcomed by all fans of detective fiction. Really good puzzler and fantastic murder mystery, but… It is written in a strange format. the entire story is told through the reports from the insurance investigator along with the witness statements and excerpts from diaries. All very formal and tidy. For people who like the plot and the puzzle and the ‘just the facts ma’m, just the facts’ the most, this is right up your alley. But if you are character driven then this might not trip your trigger. I did know the solution quickly into the book but the fun of it is reading the how we got there I guess. The introduction by Martin Edwards was worth the read though! A rollercoaster ride of 48 hrs. on the trail of a serial killer. It was love at first sight for Richard Temperley and he was determined to find the girl from the hotel and do whatever he could to help her and keep her safe. Three murders plus in just 48 hrs.! In a race against the police to find Sylvia first and a cat and mouse game with the killer to keep her safe, will Richard solve the mystery and get the girl? Richard takes us on a winding, frantic search from town to town. Will the police figure it out in time and be there when he needs them? Having read and loved The Mystery in White by Farjeon I was delighted to get a chance to read this one. Not as good in my opinion, the ‘mystery’ of what was done specifically to the killer by the person he was after wasn’t explained enough for me. But an excellent, tense, read to the last page, good mystery! I highly recommend Farjeon and British Library Crime Classic, which we can now get here in the US through Poison Pen Press! Thanks! Dr James Earle and his wife live in comfortable seclusion near the Hog’s Back, a ridge in the North Downs in the beautiful Surrey countryside. When Dr Earle disappears from his cottage, Inspector French is called in to investigate. At first he suspects a simple domestic intrigue – and begins to uncover a web of romantic entanglements beneath the couple’s peaceful rural life. The case soon takes a more complex turn. Other people vanish mysteriously, one of Dr Earle’s house guests among them. What is the explanation for the disappearances? If the missing people have been murdered, what can be the motive? This fiendishly complicated puzzle is one that only Inspector French can solve. 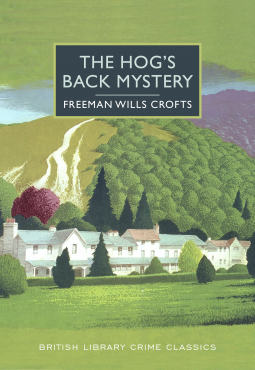 Freeman Wills Crofts was a master of the intricately and ingeniously plotted detective novel, and The Hog’s Back Mystery shows him at the height of his powers. This new edition of a classic mystery is introduced by the crime fiction expert Martin Edwards..
A wonderful solid mystery! I love how Inspector French is so methodical, going over the points of the case and clues in order, numerous times! His tenaciousness and need to make lists and tick off the boxes. It’s how I operate most times and I can really identify with him. Freeman Wills Crofts certainly plays fair, giving us mountains of clues and going over them numerous times and even listing the page numbers they are on towards the end when French is going over the whole case with his colleagues. Lots of solid suspects. I did figure it out,mostly, just not who the accomplish was or the completely how of it. Very satisfying read indeed! If you like Wills Crofts or any vintage mysteries you will for sure want to read this one! Thank you Poison Pen for bringing these vintage mysteries back to us here in America! The covers are gorgeous! 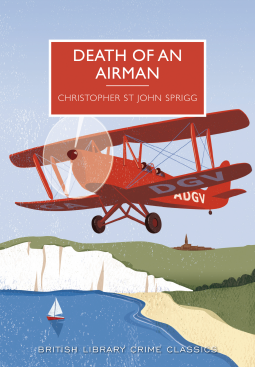 Death of an Airman is an enjoyable and unorthodox whodunit from a writer whose short life was as remarkable as that of any of his fictional creations. When an aeroplane crashes, and its pilot is killed, Edwin Marriott, the Bishop of Cootamundra in Australia, is on hand. In England on leave, the Bishop has decided to learn how to fly, but he is not convinced that the pilot’s death was accidental. In due course, naturally, he is proved right. The Bishop and Inspector Bray of Scotland Yard make an appealing pair of detectives, and ultimately a cunning criminal scheme is uncovered. An airplane crashes with several witnesses. The pilot is dead. He has been shot and his skull crushed in from impact in the plane. Which happened first? First suicide is thought but maybe not! How was he killed flying in the air with no other planes around him? Was he shot after he was on the ground and not quite dead? A great puzzle much like a locked room mystery. I did guess who it was towards the end, but it was a good time getting there. Lots of great suspects. Silly character names like Sally Sackbut, Lady Crumbles and Lord Entourage. The flying community and life at an aerodrome was new to me and quite interesting. The local Inspector Creighton wasn’t worth a hill of beans, but when Inspector Bernard Bray from New Scotland Yard was brought in we see good detective work. Between the good work of the Bishop, Bray and Crime Reporter Archie Brown with trips to Glasgow Scotland and France the solution is brilliantly pieced together. After the villain is apprehended there is a little surprise ending that finished the book off with a smile! Very satisfying read. Thanks to Poison Pen for bringing these British Library Crime Classics to the US! Hope we get more of Christopher St. John Sprigg’s books!